How can we wrap our minds and hearts around something so vast as the destruction of the biosphere and, instead of going mad, grow alert and very interested? and a brief report on Deep Play for our Common Futures. The speaker will be Genevieve Barlow, communications and engagement director with Renewable Newstead. Gen’s short talk will take us through some of Newstead’s journey towards grid-connected, locally-generated and renewable energy for the town. The town’s 2009 community summit nominated energy as a key focus for change and since then a group of locals has worked steadily on how to make the switch. 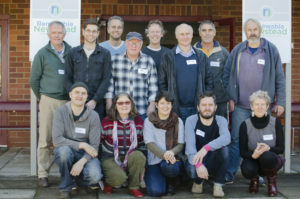 In 2015 the Victorian government provided funds for Newstead to create a commercially viable model for running the town on locally generated, renewable energy. Work to date has focussed on community engagement and on overcoming constraints in the current grid system and in community-wide renewable energy. Newstead’s wider vision is to care for our community. Renewable Newstead’s experience may inform further thinking and discussion about a Citizen’s Congress for Central Victoria. Join us on Sunday May 21st at 5.00pm for another hearty conversation followed by a shared meal. A win for climate action and collective power thanks to community action. Westpac has effectively ruled out funding the Adani mine. Releasing their new climate policy update Westpac says the bank will “limit lending to any new thermal coal mines or projects (including those of existing customers) to only existing coal producing basins” – meaning that they couldn’t invest in the Galilee Basin. Westpac has also committed to only financing new power projects that lower the emissions intensity of the grid which, for Australia, is a de facto exclusion of new coal power stations. The Central Vic Climate Action team encourage you to pop in to Westpac, or write to them, and thank them yourselves, or send a message via this link. 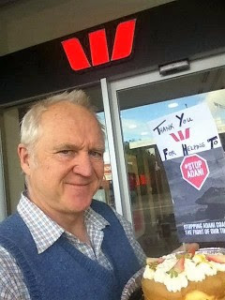 Also to let Resources Minister, Matt Canavan (Minister.Canavan@industry.gov.au, www.facebook.com/SenatorCanavan), know that it’s not just ‘noisy activists from Sydney’ who were putting pressure on Westpac. Australians from all walks of life are enormously opposed to the Adani mine. Film Screening and Greens fundraiser- Guarding the Galilee: a 30 minute documentary on the battle to stop the biggest coal mine in Australian history- Adani’s Carmichael project. Meet those engaged in the fight and find out exactly what mining billionaire Adani has planned for Australia. (Thursday 26th May 2017, 7.30pm at Senior Citizens Hall, Castlemaine. Includes a bite to eat and opportunity to meet others concerned about the Adani mine.$10 full, $8 concession). For more information email: centralvicclimateaction@gmail.com or join their facebook page. Growing Abundance seek support for their newest project, The Local– a social enterprise café where all their work on promoting local food with no waste, (including Harvest & Garden Enterprise, Hub Plot, Seed Library, Canteens, Workshops, and Catering) can coalesce. Here’s a link to The Local’s campaign page. Check out Growing Abundance for upcoming events during May including community apple press, apple harvesting, apple and cider vinegar making, biochar making, and winter pruning. Ian generated another hearty Localising Leanganook conversation with his presentation on the commons, the cooperative and the wardrobe in April. Ian reminded us that the bottom line is not economic growth but breath and connection. We live in a connected biosphere, we are the earth and we are each other. ‘Conspire’ means to share breath together. He acknowledged Suzuki and Goodall inspirations and informed us that he brings questions rather than answers. In ‘Entering the Wardrobe’ Ian discovered a whole other world, two parallel systems that cannot understand each other- the old neoliberal or the ‘Age of Me’ stories, which are broken but being trumpeted louder. These are characterised by central top down power and control, patriarchy, global wealth extraction, Jobson Growth, social and ecological limits leading to fear, nationalism, fundamentalism and collapse. In parallel are early draft new stories- the Commons or the ‘Age of We’, characterised by local, community, makers, markets, sustainability groups, fix it stores, community gardens, solar bulk buys, freewheeling fun, food hubs, stuff swapping and even local brewing, cheeses, restaurant menus and place making. We need ‘the Age of We’ because it is who we are. Ian drew on Lisa Berkman’s research- that it better for our health to have strong community links than it is to give up smoking, alcohol and fat; and on Hugh McKay- that belonging can be created where we are and the Good Life is a life of connected service. Ian took us on a journey from Hardin’s ‘tragedy of the commons’ to Ostrom’s Nobel prize winning research, which demonstrated that communities following her governing the commons rules are more successful than businesses or governments. He cited examples of Indigenous Australians management of the land as a commons; Denmark’s Samso Island which generates 100% renewable energy as a commons; and Bhive- Bendigo’s sharing economy cooperative, creating an ecosystem of local work, local enterprise, local spending, and based on the values of self-help, self-responsibility, democracy, equality, equity and solidarity. For Ian’s notes, suggested readings/podcasts, info on Bhive Coop, click here! Castlemaine’s first Repair Café kicked off on 30th April at the Community House. ‘It was great’ says organiser Chris Hooper, ‘just all fell into place- everyone just started fixing stuff, darning etc’. Contributions and ideas are welcomed. The next repair café will be on May 28th – the last Sunday in the month- from 10.00am til 2.00pm at the Ray Bradfield Room and will include a knife sharpening demo. Soup, tea and coffee available. The café is weighing items repaired as a record of what’s not going to landfill. D4D events are held on the second Wednesday of each month in the back room (not band room) at Bridge Hotel. The next event is June 14th. One or two attendees are invited to nominate a topic in advance, learn through teaching and share the burden of being informed, engaged citizens with fellow attendees. Events are held over dinner in a relaxed, conversational environment, and offer a way to engage with locals in your area. 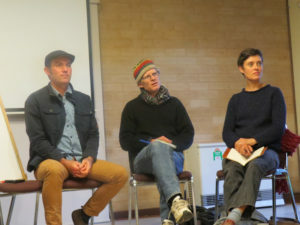 Sign up to the monthly newsletter and find out about events in Castlemaine, including a suggested reading list and possible topics: http://eepurl.com/b8jIDX. 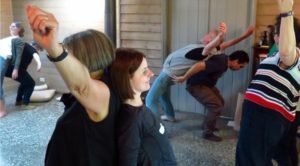 In a Deep Play encounter at Maldon Victoria on April 8, a group of 16 people came together to play with, in and on behalf of the future. 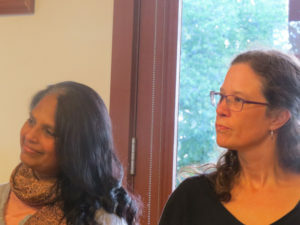 The day was hosted by Mahesh Kadasamy and Neil Bowker at their retreat The Elms. This beautiful place set the scene for the workshop run by Dr Jose Ramos and Dr Marcus Bussey. The aim of the day was to play deeply with our future assumptions and to unlock possible routes to futures beyond our current horizons. As Jose put it — this was about exploring our ‘aspirational futures’. Embodied play and the Cosmic Story were introduced by Marcus who uses InterPlay as a method for unlocking our creative selves as cultural workers. In summarising the workshop approach Marcus Bussey draws on Dutch historian Johan Huizinga: ‘Play is older than culture, for culture, however inadequately defined, always presupposes 211human society, and animals have not waited for man to teach them their playing.’ This is so, continues Marcus, because play is an embodied process in which playfulness meets consciousness and, of course, we cannot claim that only humanity is conscious in a world filled with the evidence of animals at play. For more reflections on the workshop click here. Email through to Nikki any events, information or food for thought you would like included in the next e-news or on the Localising Leanganook website.